For those of you who cannot decide on an alligator jaw or rat tooth grasper, here's the perfect instrument for you! The Ratigator - a combination rat tooth and alligator jaw grasper that give you the best of both worlds: the flat, gripping power of an alligator jaw and the precision 'pinch-hook' ability of the rat tooth. 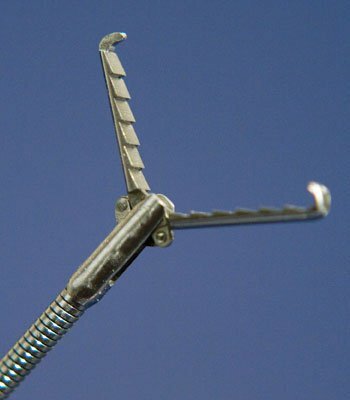 These instruments are constructed of surgical stainless steel for years of use. The 8 mm or 15 mm wide jaw opening can grasp most tissue and foreign objects in a body cavity. Removal of a tube of lotion from the stomach of a dog using the Ratigator. The instrument is available in 1.8 mm and 2.4 mm outer diameters to accommodate most endoscope biopsy channels and has an ergonomically-designed, thumb-activated handle for ease of use during procedures. 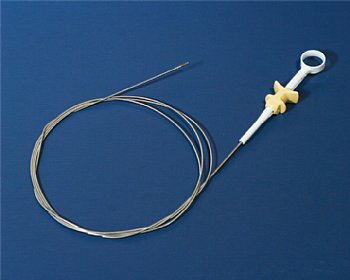 The Ratigator can easily be sterilized via soaking, autoclave or ETO gas methods. Contact us or visit our online store!